Siirry mallin DROPS 41-23 alkuperäisohjeeseen. HUOM! Mittapiirroksen mitat näyttävät vaatteen venytettynä. Joustinneuleen vuoksi jakusta tulee piirroksen mittoja kapeampi. DROPS PYÖRÖPUIKOT NRO 3 JA 3,5 SEKÄ SUKKAPUIKOT NRO 3,5 tai käsialan mukaan. MALLINEULE: *4 o, 4 n*, toista *-*. ETU- JA TAKAKAPPALE: Neulotaan tasona pyöröpuikolla. Luo 262 (278-294) s (sis. 2 reunas) pyöröpuikolle nro 3,5 luonnonvalkoisella langalla. Neulo mallineuletta, lukuun ottamatta 1 reunas kummassakin etureunassa. Tarkista neuletiheys. Kun työn pituus on 21 (21-22) cm, neulo seuraava krs näin: 64 (68-72) s = etukappale, päätä 4 s kädentietä varten, 126 (134-142) s = takakappale, päätä 4 s kädentietä varten, 64 (68-72) s = etukappale. Neulo osat erikseen. ETUKAPPALE: = 64 (68-72) s. Päätä nyt sivusta kädentietä varten joka 2. krs: 1 (1-2) x 3 s, 2 (2-2) x 2 s ja 1 (2-3) x 1 s = 56 (59-59) s. Kun työn pituus on 29 (29-31) cm, päätä keskeltä edestä pääntietä varten joka 2. krs: 7 x 2 s ja sitten joka 4. krs: 4 (5-5) x 1 s. Päätä loput s:t kerralla, kun työn pituus on 46 (46-48) cm. Neulo toinen etukappale ensimmäisen etukappaleen peilikuvaksi. TAKAKAPPALE: = 126 (134-142) s. Päätä kummastakin reunasta kädenteitä varten kuten edessä = 110 (116-116) s. Kun työn pituus on 44 (44-46) cm, päätä keskimmäiset 30 (32-32) s pääntietä varten ja neulo molemmat puolet erikseen. Päätä seuraavalla krs:lla vielä 2 s pääntien reunasta. Päätä loput s:t kerralla, kun työn pituus on 46 (46-48) cm. Neulo pääntien toinen puoli vastaavasti. HIHA: Luo 50 (50-50) s sukkapuikoille nro 3,5 luonnonvalkoisella langalla. Neulo mallineuletta (tarkista, että keskelle hihan päälle tulee 4 oikeaa s). Lisää SAMALLA keskelle hihan alle vuorotellen joka 3. ja joka 4. krs: 33 (33-35) x 2 s = 116 (116-120) s. Kun työn pituus on 44 (44-45) cm, päätä keskeltä hihan alta 6 s ja jatka neulomista tasona. Päätä nyt kummastakin reunasta hihanpyöriötä varten joka 2. krs: 9 x 4 s. Päätä loput s:t kerralla. Työn pituus on n. 51 (51-52) cm. VIIMEISTELY: Ompele olkasaumat. Poimi vasemman etukappaleen etureunasta n. 84 s (8 + 4 s:lla jaollinen) pyöröpuikolle nro 3 luonnonvalkoisella langalla ja neulo tasona 3 cm mallineuletta. Päätä s:t. Neulo oikea etureuna samoin, mutta kun etureunan leveys on 1 cm, tee tasavälein 6 napinläpeä. 1 napinläpi = päätä 3 s ja luo seuraavalla krs:lla päätettyjen silmukoiden tilalle 3 s. Poimi pääntien reunasta n. 110-120 s pyöröpuikolle nro 3 luonnonvalkoisella langalla ja neulo tasona 2 krs ainaoikeaa. Päätä s:t. Kiinnitä hihat paikoilleen ja kiinnitä napit. Hi Joanna, You are working each front piece separately and at the armhole end of every second row on each front piece bind off as follows, depending on the size you are working; so for example in size S you bind off 3 stitches one time, then 2 stitches 2 times and 1 stitch 1 time with a row between each bind-off row where you do not bind off. 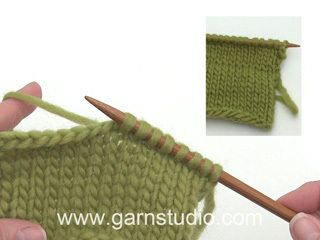 Hope this helps and happy knitting! Dear Joana, you have to cast off these 4 sts for the armhole, so you have to work them not as a decrease but as when you finish the work. Happy knitting! 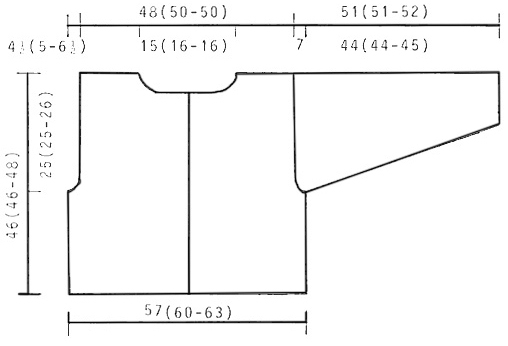 Sorry i cant understand this part, 64 (68-72) sts front piece, bind off 4 sts for armhole, 126 (134-142) sts back piece, bind off 4 sts for armhole, 64 (68-72) sts front piece. Dear Mrs Dinis, on this row you will bind off the stitches for armhole dividing front and back pieces: work the first 64 (68-72) sts, bind off the next 4 sts for armhole, work the next 126 (134-142) sts for back piece, bind off the next 4 sts for armhole = 64 (68-72) sts remain for 2nd front piece, work these stitches and continue now each piece separately. Happy knitting! Dear Mrs Dinis, buttonholes will be created when you will work the right front edge - see Assembly at the bottom of the pattern. You are right, you are first working whole body (= front pieces + back piece) in one piece until armholes, then you will divide and work each front piece and back piece separately. Happy knitting! 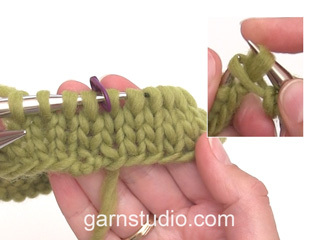 Dear Mrs Dinis, you can work the edge stitches in stocking stitch or in garter stitch. Happy knitting! 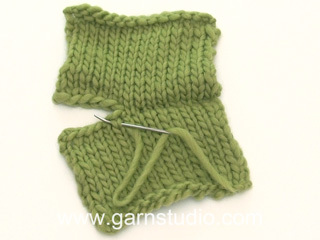 Which means this: (...) and continue knitting pattern with 1 edge sts on each side mid front ? Dear Mrs Dinis, you work as follows: 1 edge stitch, *K4, P4*, repeat from *-* until 1 stitch remains, 1 edge stitch. Happy knitting! 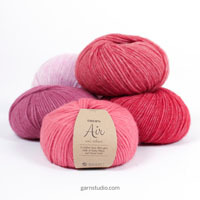 I am using the recommended Safron Cotton yarn but am struggling with the ribbing. It\'s not stretchy or springing closed. I know this can be an issue with cotton vs animal fibers but mine so far doesn\'t look nearly as tight as even the photo in the pattern. 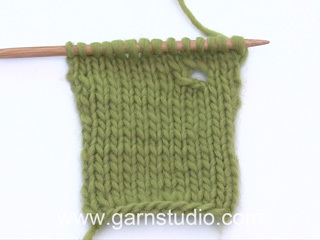 I\'ve even gone down a needle size (using #3 vs #4 in order to get gauge) yet my ribbing still looks flat. 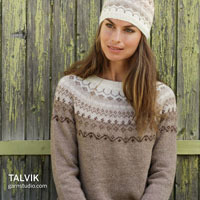 Do you have any tips to fix this....or know how the person who knitted the sweater in the photo achieved this tighter rib? Dear Mrs Girarad, this is the place where there should be a seam when working sleeve back and forth, and that's the transition of round when working in the round. Happy knitting! I have trouble understand the term NCREASE MID UNDER ARM . Also, 2 sts 33 times alternating on every 3rd and 4th round. Does that mean on both sides of the needle? Dear Mrs Girard, see increase mid under arm in previous answer - increase 33 times alternately on every 3rd and 4th round as follows: work 1 round with inc, *2 rounds without inc, 1 round with inc, 3 rounds without inc, 1 round with inc*, and repeat from *-* until you have inc a total of 33 times and you get 116 sts. Happy knitting! Need help understanding the term in the Sleeve pattern: ''at the same time, inc. MID UNDER ARM. What does that mean exactly? I wait till I am half way to the end of the sleeve or what? Also, do I increase both sides of the sleeve, when it says 2 sts. 33 times alternating on every 3rd and 4th round. Dear Mrs Girard, you will increase mid under arm by working until 1 st remain before beg of round, inc 1 st, work last st on round, (marker beg of round), work 1 st and inc 1 st = you have inc 2 sts mid under arm (ie on each side of beg of round). Happy knitting!